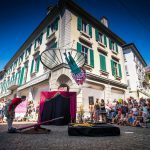 The 26th three-day Vevey festival of street artists starts on Friday 24 August at 3:30pm and takes place at nine locations on the cobbled streets of Vevey’s old town. The show, a kind of outdoor circus, includes acrobats, jugglers, mimers, fire breathers and tightrope walkers from around the world. 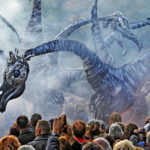 The show, which showcases 20 artists from around the world, typically attracts around 30,000 spectators. 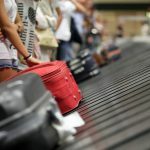 Artists, which come from around Europe, Israel, Argentina, Peru, Canada, Brazil and Japan along with groups from two of Switzerland’s circus schools, were selected by the organisers from hundreds of entries. Three groups will be awarded prizes based on public votes. There will be voting boxes on the street. During the event, drinks and food stands will be positioned around Place Scanavin. 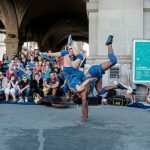 Supported by the commune of Vevey, and around 120 volunteers, the spectacle is free to the public, although following in busking tradition, performers will gladly accept tips. Vevey old town. Click here for details of the nine locations.